To accompany the Bill of Rights, the Museum will host two ‘marquee documents’ from the collection of the National Archives and The Senate. The first is a version of the Bill of Rights as passed by the Senate in 1789. During several days of debate, the Senate edited, deleted and reorganized the seventeen amendments proposed by the House of Representatives into only twelve. This draft contains most of the final text of the Bill of Rights as ratified by the states. However, some notable changes were made in the conference committee between the House and Senate, including edits to the religion clauses of the First Amendment. Those changes appear in Article the Third in this draft, which later became known as the First Amendment since the states ratified ten of the twelve amendments proposed here. The omission of a bill of rights proved to be a mistake almost fatal to the Constitution. New York and several other states agreed to ratify with the promise that the First Congress would add rights to the Constitution through the amendment process. These states might have rejected the Constitution without the promise of a future bill of rights. New York’s ratification included proposed amendments for the First Congress to consider. The New York ratification is significant because it is one of the few that lists the twelve amendments proposed to the states by the First Congress, ten of which became ratified and collectively known as the Bill of Rights. The New York ratification also helped pave the way for the Bill of Rights to be added to the Constitution. After the Bill of Rights was ratified in 1791, Americans’ rights were not completely protected. The Bill of Rights only prohibited the Federal Government from restricting rights—the protections did not apply to state governments. Case by case over decades, the Supreme Court, using the Due Process clause of the 14th Amendment, incorporated most of the Bill of Rights to apply to the states, too. 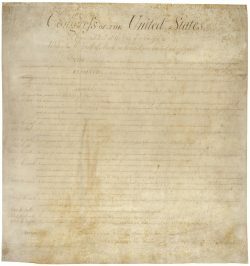 The Houston Museum of Natural Science will be the premier venue, opening Amending America: The Bill of Rights to the public September 5, 2016 through January 8, 2017. The exhibition will be on view during the 2016 Election period, and to celebrate the 225th anniversary of the Bill of Rights in December 2016. Help Your Students Get The Most Out Of Their Trip To The Museum! We offer free curriculum specifically tailored for each grade level or high school course.